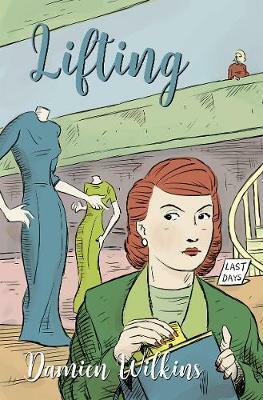 LIFTING is one of those books that is charming, slightly eccentric, sad, happy, and wonderfully engaging. Set primarily within the walls of the oldest department store in New Zealand, Wellington's Cutty's is an institution that's been marked for closure. Non-New Zealander / Wellington readers will be forgiven if you can't help but feel this is a real place, renamed for the purposes of fiction, as there is so much about the store and it's history, and the affection that the staff and customers have for it that feels real, and very heart-felt. For those on this side of the ditch there's something vaguely Georges about the place - right down to the staircase, and if they didn't have a piano being played in the foyer, than they jolly well should have. But marked for closure Cutty's is, and the staff who work there are confronted with the short lead in time of a couple of months to get used to the idea. The story evolves from the point of view of Amy, store detective, her four years at the store is nothing compared to the life long service of many employees. But she really likes the job, loves the store and she's pretty good at what she does. On the home front she's married, recently had a child and only just gone back to work. With a very ill mother and all the problems of balancing child care, home life and work, Amy's voice is beautifully done in this novel. She's got more than enough to deal with, without throwing in, very late in the stage, a surprise dead body. But really, LIFTING isn't about crime. It's about people, and lives lived, and pasts, presents and futures. It's about disruption and change, and slipping standards, and chaos. At work, at home, and in small ways as well as major. Losing your job is chaotic, especially through no fault of your own. Losing your job when getting it in the first place was a minor miracle is even more unsettling, and Amy's background as an activist means her boss really took a chance on her as a detective. The fallout through family, relationships and everything is hard to avoid, as is the loss of friendships and working relationships established. For something that's addressing chaos, LIFTING has a gentle, laid back, soft styling. Which makes some of the revelations even more elegantly done. From activist to store detective, from young single woman to mother, wife and worker, Amy's journey is laid out in a most engaging manner. Surrounding her with some wonderfully colourful characters made it even better, and frankly, some of the revelations into how people go about shoplifting were staggering - international cabin crew uniforms and all. A little on the eccentric side, LIFTING is a really lovely little novel full of great insight, humour, sadness and joy. I'm not 100% sure I'd call it crime fiction but it's certainly entertaining fiction. Karen Chisholm is one of Australia's leading crime reviewers. She created Aust Crime Fiction in 2006, a terrific resource - please check it out. Karen also reviews for Newtown Review of Books, and is a Judge of the Ned Kelly Awards in Australia and Ngaio Marsh Awards in New Zealand. She kindly shares her reviews of crime and thriller novels written by New Zealanders on Crime Watch as well as on Aust Crime Fiction.